En décembre 2011 est sorti chez Black Library un roman inédit en anglais dans la collection A Space Marine Battle Novels. Il sortira en français en juillet 2012. 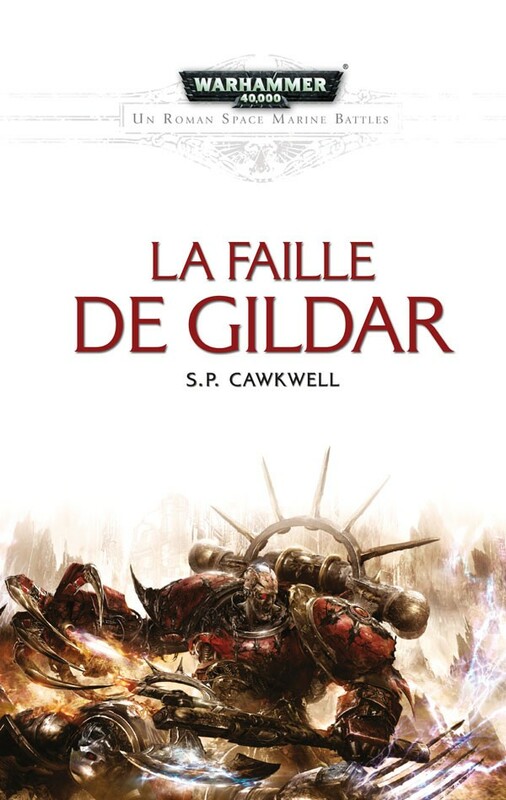 ==> LA FAILLE DE GILDAR de Sarah Cawkwell. Quand le Wolf of Fenris émerge du Warp, les Silver Skulls se lancent à l’abordage et trouvent l’antique vaisseau de guerre aux mains des Corsaires Rouges. Mais il ne s’agit pas de simples pirates, le renégat Huron Sombrecoeur et sa flotte au grand complet préparent une attaque d’envergure. La conquête de la Faille de Gildar consoliderait l’influence du chef de guerre de manière considérable, et seul le Capitaine Arrun et ses Silver Skulls sont en mesure de l’arrêter. Alors qu’une bataille spatiale fait rage et que les deux camps échangent des salves de torpilles, le génie tactique de Arrun se mesure à l’expérience de son adversaire. Ce n’est pas dans l’espace, mais bien sur la surface de Gildar Secundus, que ce jouera le destin de la Faille. Cela m'a l'air intéressant et ce n'est pas souvent qu'une femme écrit des livres Warhammer 40000. Un livre sur Huron, ça peut être sympa, une couverture assez belle. moi aussi je suis preneur. maintenant, va savoir quand il nous le traduirons. Intéressant. Un auteur qu'on ne connait pas, quelqu'un a déjà entendu parler d'elle? A freelance writer based in the north east of England, Sarah is old enough to know better, but still young enough not to care. When not slaving away over a hot keyboard, Sarah's hobbies include reading everything and anything, running around in fields with swords screaming incomprehensibly, and having her soul slowly sucked dry by online games. Her minimum bribe level is one chocolate orange. Ce n'est pas très détaillé. Elle a surtout écrit 3 nouvelles publiées dans le magazine Hammer & Bolter. Horus Lupercal a écrit: En décembre prochain sortira un roman inédit en anglais dans la collection A Space Marine Battle Novels. ==> THE GILDAR RIFT de Sarah Cawkwell. Dans les profondeurs de l'espace, les Silver Skulls tentent de s'emparer de la puissance de Huron Blackheart et de ses Red Corsairs. Un roman sur les spaces marines du Chaos. Je voulais savoir,le livre est vu du coté de huron ou des silver skulls? si c'est du coté de huron ce serai génial. ca serai bien une mini serie sur la guerre de badab. Il y a des chances pour que le roman nous fasse suivre les deux. Le roman The Gildar Rift de Sarah Cawkwell fait l'objet d'une preview commentée (en anglais) sur le blog Angels of Retribution. Fait couler beaucoup d'encre ce roman. Peut-on l'espérer pour une sortie en français avant la fin de l'année prochaine ? Je l'attends avec impatience, je joue Silver Skulls ! ça va être bon pour l'inspiration ! Ce sera sans nulle doute le prochain titre à sortir en français après La Bataille du Croc. Peut-être en septembre 2012, voire en fin d'année. Que de livres qui arriveront vers Septembre 2012.
huilliam a écrit: Je l'attends avec impatience, je joue Silver Skulls ! ça va être bon pour l'inspiration ! Moi de même, jouant Red Corsairs! I’ve had occasion to mooch around a few Games Workshop stores in my time; both as a teenager looking to kill time on a Saturday afternoon and a guy in his mid thirties (thirty six is still ‘mid thirties’ dammit!) who’s after indulging his fascination with well painted toy soldiers. I love what they do in these stores, just a shame that my wallet isn’t as enthusiastic. One thing that seems to be the same now as it was back in my teenage years is that I’ve only ever seen guys in Games Workshop stores, no ladies at all. I don’t know why this is but that’s what I always find. If you’re a GW frequenting female please leave a comment and prove me wrong but it’s looking very one sided in the meantime. Up until now, this phenomenon has been mirrored on the publishing side of things with the Black Library. 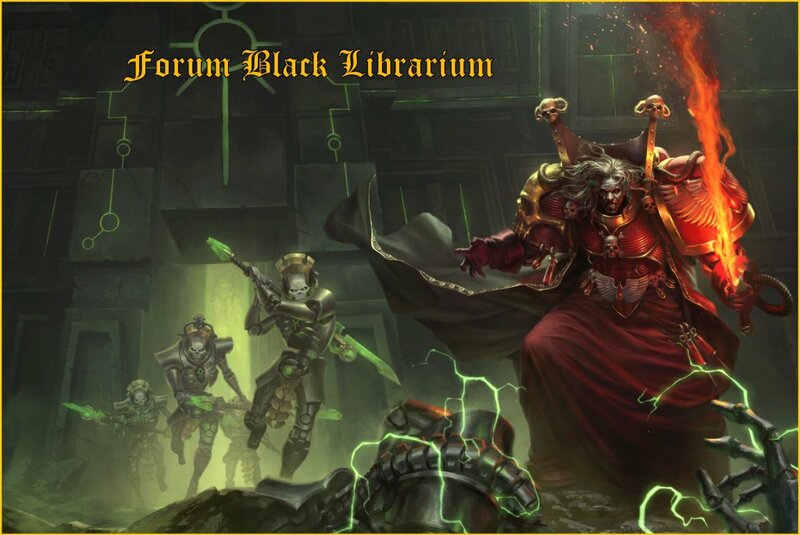 Barring a few short stories here and there (thanks to Nik Vincent and Juliet E. McKenna), Black Library is typically a male preserve for male writers. Again, not sure why this is; maybe that’s just the way things go sometimes. It looks like things might just be about to change though. Sarah Cawkwell has already submitted stories for ‘Hammer and Bolter Magazine’ and her short story ‘Primary Instinct’ appeared in ‘Victories of the Space Marines’. While I wasn’t too keen on ‘Primary Instinct’ I was still interested to see what Sarah’s first full length Black Library novel was like. After all, you’ve got to be doing something right if you’re commissioned to write a novel off the back of a few short stories, surely? I kind of have a ‘love/ hate’ thing going on with the ‘Space Marines Battles’ series; if you’ve been reading for a while then you probably know this already. This particular series just so happens to be the very series that Cawkwell’s debut novel finds itself in. While I had a few issues with ‘The Gildar Rift’, they were issues that I have with the series as a whole. ‘The Gildar Rift’ fell on the right side of the fence for me though; I’d certainly stick around to see what Cawkwell comes up with next. The big problem that I have with the ‘Space Marines Battles’ series is that, well... battles aren’t really cut out to be the main focus of an entire book are they? A battle is something that a plot might hinge upon but no more than that, certainly not an entire book’s worth. This is especially the case when your protagonists are superhuman warriors engineered to make armed combat a very straightforward and bloody affair. They do a ‘no frills’ job but a book needs some frills to make it interesting. Several of the books in this series have fallen down, to one extent or another, because of this. Like I said though, ‘The Gildar Rift’ avoids most of the obvious pitfalls and is worth picking up because of this. Cawkwell’s master stroke is to make ‘The Gildar Rift’ about far more than just a stand up fight between two sets of fairly evenly matched Marines. The Silver Skull’s ‘Resurgent Project’ takes equal billing with the main event and it’s interesting to see how the character of Volker Straub develops under the pressures of both the project and the ensuing war with the Red Corsairs. Alongside Volker Straub, Cawkwell’s depiction of Jeremiah (the incredibly insecure navigator) also adds a human element that offsets some of the ‘superhuman’ stuff and fleshes the plot out a little bit more. Even the Marines (on both sides) get similar treatment and the end result are protagonists where you really get a feel for why they are fighting so fiercely. I love the character of Huron Blackheart, absolutely ‘off his face insane’ but still able to scrap it out with the best of them when the need arises. What I would say here is that although the background history of the Silver Skulls is important, there wasn’t enough there to make going into it in such big detail a good thing (especially when it’s made clear that the Silver Skulls aren’t really aware of their ultimate origin anyway). I found myself skim reading these bits, which occurred far more often than was necessary, and that’s never a good thing. When action really kicks off, either in the depths of space or on Gildar Secundus, Cawkwell proves to be more than up to the task of displaying Marine on Marine combat in all its bone crunching and visceral glory. While the battles themselves are a little too straightforward and simplistic (X moves his squad to point Y, Z counters...) it’s the more personal moments that are worth the price of entry. Cawkwell really doesn’t pull any punches. ‘The Gildar Rift’ doesn’t quite escape the issues that, for me, have plagued this series. What it does do though is give us a bunch of characters that we want to invest in and then put us through the wringer as we wait to see their fate. You can’t really ask for a lot more than that. 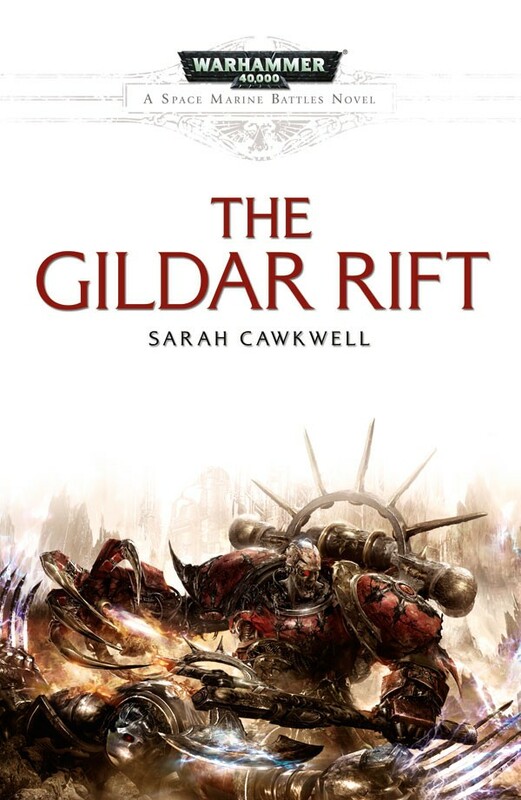 Sarah Cawkwell’s debut novel, The Gildar Rift has been eagerly anticipated by fans of the Warhammer 40,0001 books, as the author’s previous short stories (which can be found regularly in the e-zine Hammer and Bolter ) have been very well received. Cawkwell’s style combines the over-the-top elements of the popular sci-fi setting with character driven plot and a keen eye on this heavily baroque world. This is the sort of thing that fans of Black Library2 books like a lot; the 40K fandom likes it’s big, power armoured super-humans to be actual people you care about, rather than just blobs of male-power fantasy. So it comes as no surprise that, The Gildar Rift is pretty damned good. It’s another one of those Space Marine Battles3 stories, this time focusing on a conflict near the titular Gildar Rift, an unstable region of space prone to raids by Demon-worshipping space pirates known as The Red Corsairs. Defending this region of space are the Silver Skulls who are religious and steadfast space-knights, who rely on superstition for guidance. (Yes, that’s right. Demonic pirates in power armour in space. Wielding chain-saw swords. Fighting knights in shining power armour. In space. Who also wield chain-saw swords. This is why people love this setting so much). The action splits three ways; we get starship battles, gritty land war and internal conflict from both factions. The starship battles are glorious, I do enjoy reading about big things going boom and Cawkwell4 mixes the vastness of space with the sort of edge-of-your-seat action usually reserved for the likes of Pirates of the Caribbean. The ground war element is very dynamic; plots and counter plans on both sides mean that the action is constantly rolling, and each leads to a dramatic conflict, rather than simply one long drawn-out fight. This gives us time to care about the heroes, adding weight to the narrative. Running through these scenes of war are two subplots that give us stronger insight into both sides. The bad-guys get a tale of treachery and deceit, punctuated by evil cackles and barking-mad monologuing. Meanwhile, the heroes get a rather touching tale of hi-tech heresy and the search for one’s place in the universe. The book is also filled with some lovely touches to the setting. From a subtle shout-outs to fans to pointed observations on the domestic side of the world, this book is a stunning debut, and also a good entry point for those looking to get into Black Library books. 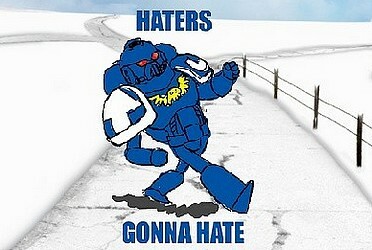 1: Yes, it’s another review featuring 40K. You may have gathered by now, what with the retro-sci-fi game I’m creating, the Doctor Who love and the reviews of 40K books that I love British Sci-Fi. 2: The Black Library is the name of the book publishing arm of Games Workshop. Over the years, it’s nurtured a goodly amount of British genre writing talent, and has helped spawn a number of other British genre publishers. 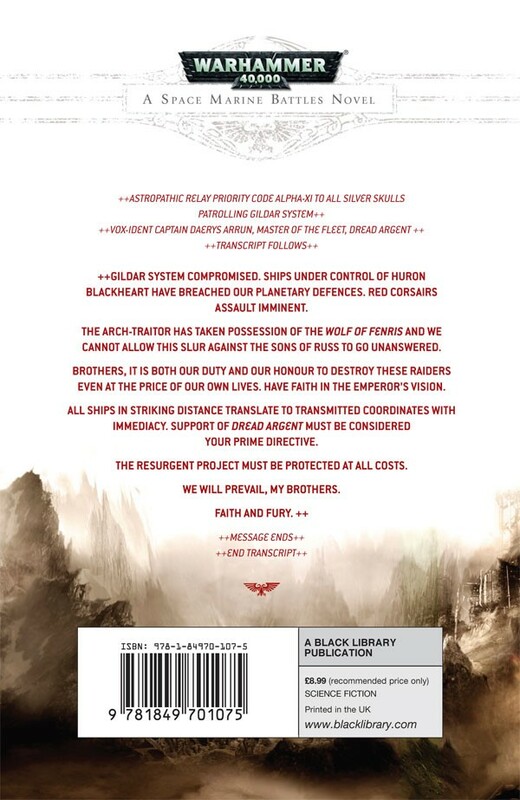 Or to put it another way, well done Black Library, keep up the good work. 3: I reviewed Nick Kyme’s Fall of Damnos a while ago. 4: I’m only aware of a handful of women who’ve written for the Black Library, and by utter coincidence, I’ve met two of them (Sarah Cawkwell and Debbie Gallagher) at LARP events. Both women tried to kill me, but that’s fair enough, people are always trying to kill me at LARP events. It’s a talent of mine. Une interview de Sarah Cawkwell postée hier sur le blog Graeme's Fantasy Book Review ! Un extrait en spoiler ! There must be countless Chapters of Marines fighting their way across the Imperium, what led you to focus on the Silver Skulls? Can you see yourself writing more about this Chapter in the future? I’d developed some stuff about the Silver Skulls alongside some friends on the old Bolthole forums and over time have grown very fond of them. My fellow forumites were very supportive of my pursuing getting some of our stuff into canon. Of course, some of the things that were originally developed were thrown out for being too radical and stringently anti-codex, but many other things have remained. Above anything else, I like the tribal, superstitious nature of the Silver Skulls. I also like that they are going through a vital period of change in their history, a change that they may have left too late. I’d definitely like to write more about them. There are too many characters in my head I want to give screen time to. 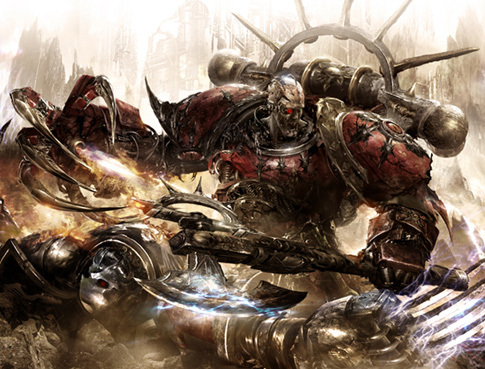 Huron Blackheart is a pretty major character in the Warhammer 40K universe. What was it like to have him stride around in your novel? Were there any constraints that you felt in writing about a character that may yet have a part to play in future books written by other authors? It was wonderful. He took on a life of his own. Whilst I was writing The Gildar Rift, Aaron Dembski-Bowden was also completing Blood Reaver, so we spoke a bit about how our different realisations of the same character could marry up properly. It was definitely a great honour to get hold of a character like Huron. There’s just something so immensely satisfying about being able to write for a character who is as mad as a box of frogs, but who still possesses the remnants of one of the most brilliant strategic minds ever. ‘The Gildar Rift’ ends with one particular story left unfinished (and it just had to be about the guy I was rooting for the most...), are you planning on tying up any loose ends in a future book? I most definitely hope so. The character I’m guessing you are talking about is one who actually survived the original draft cull. He was scheduled to die somewhere around page 300, but I’d gotten too attached to him (see previous comment about investment in characters). So his over-arcing story changed completely during the process of storytelling. The ‘Horus Heresy’ books are a pretty big deal for Black Library at the moment, have you got your eye on writing one in the future? That’s the dream of any author who gets taken into the Black Library fold, I’m sure. It would be an absolutely brilliant opportunity should it arise and I’d leap at it. To be able to contribute to such a rich series would be amazing. Est-ce une erreur? Parce qu'ils ont bel et bien traduit le résumé ! Car dans l'ordre de parution Battle of the Fang est devant Gildar Rift. Le résumé est en français mais le bouquin est en anglais. On aurait été au courant ici depuis longtemps si ce titre avait été traduit et programmé pour une publication chez nous. Je sais bien mais dans ce cas pourquoi avoir traduit celui-ci plutôt qu'un autre?